I found out a day or so ago, just after I completed work on the beta test version of my first 24-patch set for the Fender Mustang II v.2, that bulk load patch sets created on the Mustang II won’t work on the Mustang III. That’s consistent with my experience with Digitech and Zoom devices too–the lower-end model patch formats aren’t consistent with the higher-end models. It’s actually less complex with the Fender Mustang amps than it is with Digitech RP devices. Fender uses two formats for bulk loads–one for the Mustang I-II, and the other for the III-IV-V–and a common format for single patches on all the devices. So I could conceivably release the patches in single-patch format only for all Fender’s Mustang series amps, but I like my licensees to do as little work as possible. So in addition to the Mustang II I picked up used last week, I went out yesterday and traded a couple of amps I haven’t used for years for a Fender Mustang III v.2. This amp is a big step up from the Mustang II in several ways–performance, features, and price, for starters. These are the first actual combo amps I’ve brought into my house in years, and ironically it’s because amp modeling technology has advanced so quickly. It’s less expensive to build an amp with a dozen different amp and cabinet models, multiple reverbs and delays, and lots of modulation FX than it is to build a classic 5 watt tube amp. Anyway, how many 5 watt tube amps is enough? For me it’s one. Before I go any further, I want to note that my design philosophy with patches for the Fender Mustang amps is straightforward. I’m aiming to give players who focus on Chicago Blues and Classic Rock a set of great traditional sounds for those styles. I want the player who buys one of these amps and a patch set from me to be ready to play the blues with a bunch of great sounds in a matter of minutes. Roughly for the price of a harp-ready 5 watt tube amp, they can get something that will give them dozens of variations on amped blues styles with and without classic reverb and delay FX. As a bonus, I’m throwing in some clean reverb and delay only patches for those occasions when sweet and pretty must replace down and dirty. With my Digitech RP and Zoom G3 patch sets, I’ve created some pretty outside stuff to go with the more traditional styles. With the Fender Mustangs, it’s amped-up blues and rock (almost) all the way (and the rest of it is clean reverbs and delays). I’m not using an audix Fireball to develop these patches. I’m using three mics–a Bottle o’ Blues, a Shaker Dynamic, and a Peavey M1 vocal stick mic–to test these patches, instead of my usual Audix Fireball V, because the people who use these patches will mostly use the mics that go with traditional blues. Or so I think. Now that I’ve had my hands on a couple of different Fender Mustang amps, there’s no doubt that they are more complex (and therefore difficult at first) to operate than a traditional tube amp. The number and functions of controls on a modeling amp with FX are far more complicated than a traditional amp. 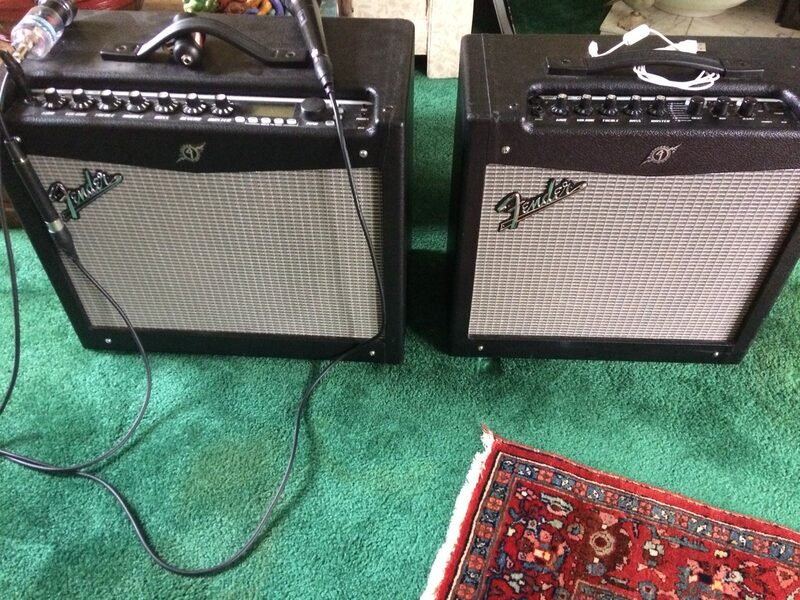 So basically the challenge I’ve set for myself is to make it this easy for the owner of one of these amps: 1) They get the amp. 2) They download the software from Fender and install it on their PC on the first try. 3) They load my sounds from the PC into the amp via USB. 4) They plug in a mic and start playing. From that point on, every time they use the amp, they only need to turn one dial to get dozens of classic acoustic and electric blues harp-friendly tones. Easy to use and great-sounding: those are the two basic principles for the patch sets I make. Some devices that have sold a lot of units don’t get any love from me because the software that supports them is horrifyingly bad, and if I have a bad experience with that stuff a customer will too. I think customers will enjoy the Mustang experience. 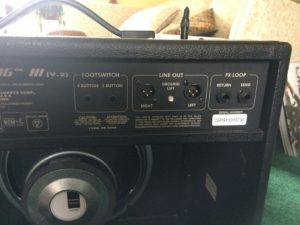 The Mustang II has a 12″ speaker and 40 watts of power. The Mustang III has a 12″ speaker too, but it seems to be a lot deeper front to back and heavier than the one in the Mustang II. The III certainly weighs a lot more than the II, has a bigger cab notwithstanding the common speaker size, has 100 watts of power on tap, and stores up to 100 presets, user customized or Fender standard, compared to the Mustang II’s 24 presets. The III also offers XLR outputs for recording or stage amplification, an external FX loop, and inputs for 2- and 4-button footswitches and an expression pedal. In other words, the Mustang III is a much more powerful and performance-ready amp than the Mustang II. The Mustang III’s front panel is also a LOT more useful for a gigging musician than the Mustang II’s. Leaving aside the potential for adding 4-button and 2-button footswitches separately or together to the Mustang III, the III’s front panel includes a very useful display of the current patch that tells you its name and which types of effects are present and active. You can turn FX on and off with a button push, even without a footswitch; the display and illuminated buttons make it easy to do that even when there’s no footswitch. I’m working without a footswitch for now. The Mustang III offers an input for an expression pedal, but I’m not all that interested if I’m not gigging with the Mustang, which is the likely state for the near future. Anyway, footswitch settings are apparently not common across patches, meaning they have to be programmed per patch, and that’s a lot of work when the Mustang III front panel offers buttons dedicated to delay, reverb, mod FX, and so on–almost exactly the same functionality as the footswitches in a Digitech RP500, but designed for fingers rather than feet. Speaking of panels: the back panels of these amps clearly reveal the intended audiences. 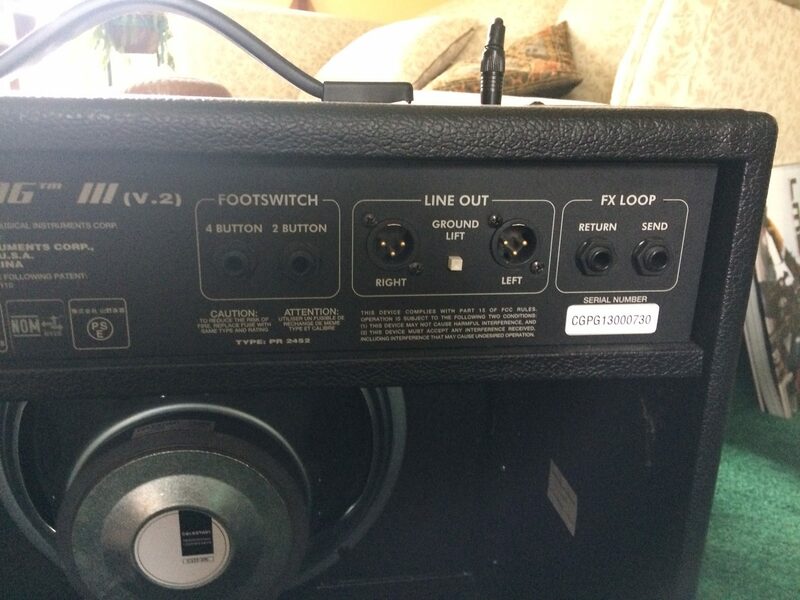 The Mustang II’s cabinet is a closed-back design, and the only thing on it is an input for the power cable. It’s a back panel that screams “what’s in the box is what you’ve got.” In these days of digital connectivity that makes everything an input or output for a recording or stage console, the absence of connections for external devices is a red flag signifying that the amp is intended for home use and (maybe) light gigging. 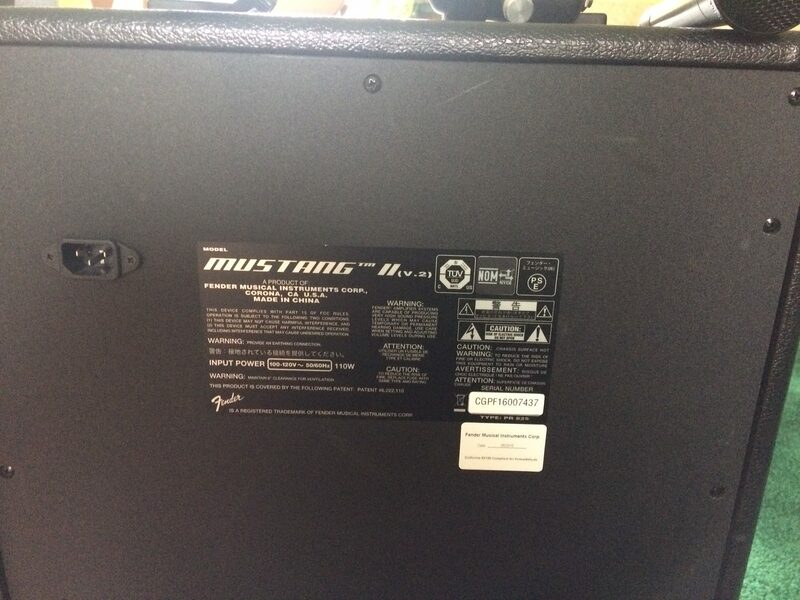 Mustang II back panel. Move along folks, nothing to see here. The Mustang III, on the other hand, has ins and outs for an external FX loop, two XLR outs for connection to a console for recording or stage amplification, and inputs for 4 and 2 button footswitch controllers, which may be used separately or together. This is a decent set of pro features. I’d have liked to see the XLR outs (or a mono 1/4″ out at least) on the Mustang II, but clearly a decision was made with that amp to reduce pro features in order to get the price point down. 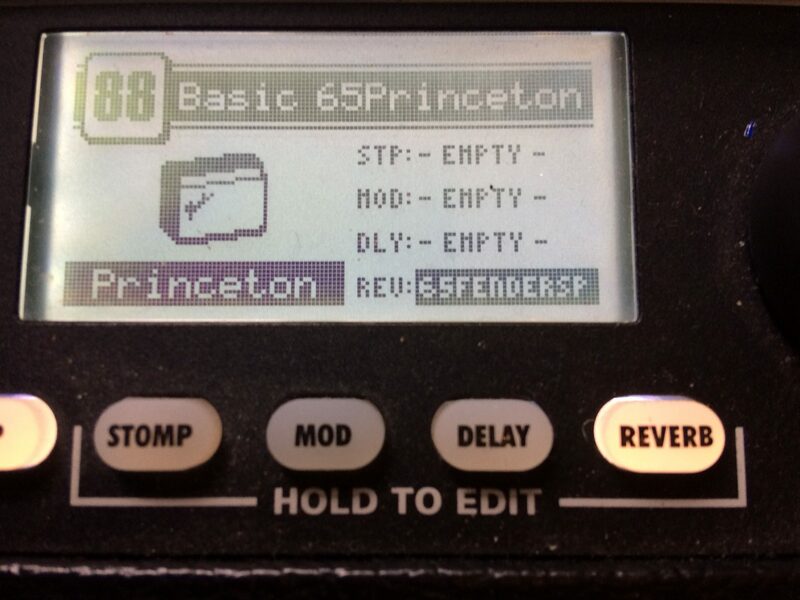 Both the Mustang II and Mustang III can function as a USB audio interface to a computer, which is fine, but the Mustang II’s absence of any line-out means that you have to mic it onstage to get more volume. Did we mention that if you’re planning to use this amp on a range of serious gigs, you’re much better off with the Mustang III? I acquired my Mustang II for $109 in very good condition, shipping not included; the Mustang III, which is in “great” condition, cost me $229, paid for in this case with my trade-ins. 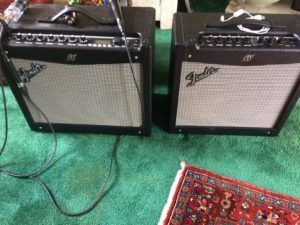 Note that neither of these amps comes with metal corner protectors on the cabinets. If you plan to move the amp around frequently, I’d install a set of those. Corners get hit pretty hard out there in the real world. I don’t plan to replace my Digitech RP500-based rig with this for gigging, but if and when I do corner protectors will be a priority. I’ve been working on the patches for these devices for about a week. The Mustang II set is in beta, and because I can transfer patches from the Mustang II to the Mustang III, I’m more than halfway done with the beta for that amp too. FYI, I was incorrectly advised by Fender tech support that individual patches, or “presets” as Fender calls them, can’t be traded between the two devices. On the contrary, when I brought up the Mustang III in FUSE, it immediately recognized and loaded patches I’d created and saved with the Mustang II. Fender, maybe you should re-up on the training program. I’ve just been listening to John Mayall’s “California.” He came to Fox Lane our senior year — you must have been there, right? I remember it was an incredibly poor turnout, really humliating. Glad to hear from you. I think I was one of the ones who missed the Mayall show–don’t remember why. My favorite Mayall record of all time is “A Hard Road,” deeply moody blues with the magnificent Peter Green (who not much later destroyed himself with LSD) on lead guitar. Me and mine are doing well, thanks! Getting ready to record my second record in two years. Trust you and yours are well too–I seem to recall Mark telling me that you’re in academia now?